Good news for the construction industry this morning: The Commerce Department announced that on a seasonally-adjusted basis there were 1,091,000 new residential construction projects begun in November, a 22.7% increase, or the biggest one-month jump since 1990. 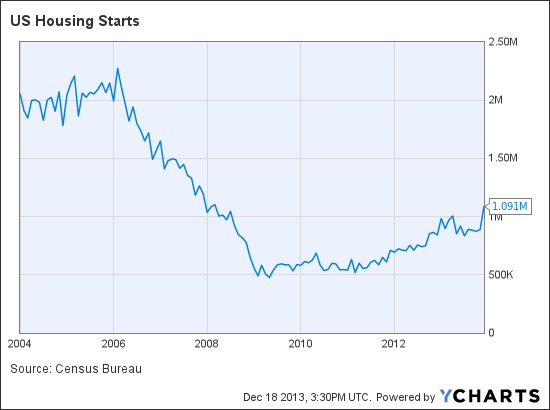 As you can see from the chart below, the absolute number of new projects–called housing starts–is at its highest since 2008. It’s never a good idea to draw hard conclusions from one month of data, but the trend is obviously positive, and the jump in construction in November backs up predictions from analysts like Goldman Sachs’ Tom Teles, who believes that the home construction industry could add 300,000 to 500,000 jobs next year, and possibly twice that number if construction-related fields are taken into account. Last year may have been the year where we saw home prices recover, but it’s increasingly looking like 2014 is the year where the economy will benefit more broadly from those price increases.